when you move into someone else’s home, you acquire, among other things, someone else’s bad taste. there were things that needed fixing right away – like the black and silver puff painted bathroom. there were things that we knew we’d probably never fix. and there were the things we wanted to fix…at some point in the future. well, for my family room, that point is now. i’ve lived with the previous owners’ eyesore of a fireplace and fugly green carpet and fake wood shutters for the past 5 years. and i’m done. i’m so done. now, my challenge to you is this. 1. floors. carpeting? hardwood? what do you think? the problem is that we have hardwood on the rest of the first floor (minus the kitchen) and we are not going to be able to match it. can we still put hardwood down? 2. fireplace. what to do with it? any ideas? 3. paint. our couches are navy blue. and the walls in the connecting kitchen are a light blue. According to my MIL, the “in” thing to do is go very neutral (think off whites, pale creams, etc) on the walls and floors and define colour with the furniture and accents. However, my MIL is a childless woman in her 60s who freaks out when the munchkin has a juicebox outside the borders of the kitchen tile, so let’s call that “plan b”. Personally, while I prefer hardwood, I don’t think it will look right if it isn’t a match. I believe that even if you decide you want the wood and go for it, you’ll be frustrated with the boundary between the two rooms. With that being said, carpet is the way to go, in my opinion. I’d go with “burbur” (NO idea how to spell it… maybe someone else, like MTM, will tell you what I mean) which is good for high traffic (like family rooms) in a darker tone. As far as colour goes, it’s really your call. We have (somewhat) similarly coloured furniture and we went with a deep sage green on the walls. The combination of steel blue and sage green is actually quite nice. 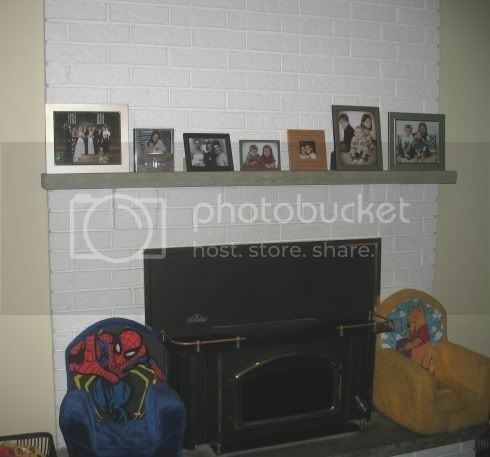 I really hate that they painted the brick on the fireplace. I don’t know if it’s possible (I don’t think it’d be cheap) to remove the paint and see the brick colour underneath… maybe that would work. You could also refinish it (remove all the brick and put new stone up… then you’re talking about co-ordinating that with the flooring and walls though, so be careful). OK, I feel enough like Martha Stewart now. I need to go wash myself. Anyhow, I agree with him (wow, that is truly a surprise here) that you wouldn’t want mis-matched hardwood! I think I would be inclined to go carpet too. Although, I don’t think I would go dark, I’m thinking a dark beige of sorts. Are you wanting to paint the kitchen too or just the family room? If you go blue in the family room, it will make your furniture look more grey. If you want the blue of your couches to pop out, you need to choose something else, more neutral–what about a nice deep taupe? 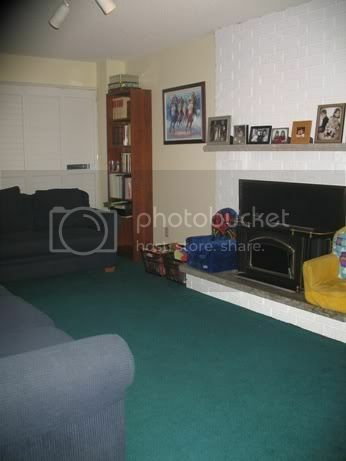 As far as the fireplace–geez, that’s a tough one! What about plastering over top of the brick??? What colour paint do you have on the rest of the main floor? That always plays a part too. Tv size: All kinds of people are putting HUGE tv’s that have no business being in small spaces, but let’s face it, do you care more about the way it looks or watching some darn good tv? Good luck with your decision making and I cannot wait to see the results!!! ~the rest of the house is very neutral…like, light grey-ish/beige-y neutral…which is kind of why i wanted to stay away from neutrals here. Cover the brick at the top with an MDF box and decorate with mouldings. Paint. You may be able to match your wood floor if you find someone who has access to old floors from restoration projects. The other option is go a completely different colour of wood floor in that room – your existing is a medium shade, so you could go really deep walnut or really light maple – you may be able to find a transition moulding that has both shades in a pattern. I personally hate carpet, so would opt for anything but! As for colour, get your fireplace and floors done first, then pick a deep neutral shade that complements both. Navy blue with go with almost anything. Okay – that green is kind of ugly. I think burber is nice – and it makes it very family roomish. If you want to go hardwood though I think you could if you made it purposely different. I saw a model home that had a dark walnut floor in the family room whereas the rest of the house was different. It sounds weird, but it looked really nice. I don’t think trying to match would be as successful. I totally agree about the big tv. We got a 44″ tv a couple weeks ago – it’s large and it takes a lot of space, but it’s in a corner and nicely placed and I don’t think it overwhelms. As for paint, I think in family rooms you can go bold if you want. We just painted our living room/dining room (accent walls) chocolate brown. I LOVE it. It is surprisingly nice. 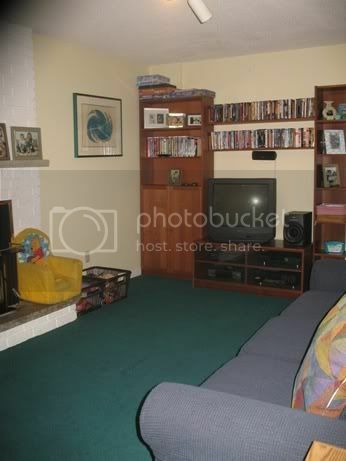 But maybe not with the couches you have – but my point is going a dark shade can be beautiful. PS My bedroom is a horrible horrible dusty fuschia colour. We were interviewing a cleaning lady last night and she honestly said “I hope this colour was from the previous owner.” I don’t think she would have agreed to take us on if we’d said “no we chose it ourselves”. People make the weirdest choices! Don’t know what to tell you about the floors. On wall colors I’m always fond of khaki-ish. Fireplace could be covered with stone, if you like that sort of thing. Or a wooden front maybe? Or just paint it, if you want to keep the brick. I think a light stone/gray with cool undertones for your walls, it would help the flow between rooms and go well with navy. 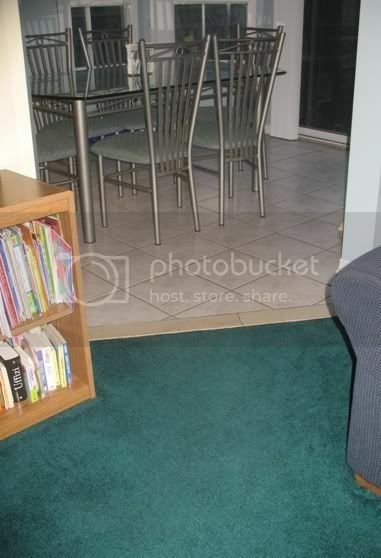 I think you could find a close match for the floors, then get a rug for the room. Preferably a cheap one that can be abused by the kids!! I wouldn’t recommend carpet for another, oh, 18 years or so! (I have a 2 year old & we now have a new Danimals stain on our family room rug). I wish I could help, but I’m the person who let her builder pick half her finishes. Paint the room a nice warm neutral, a deep light brown or a gray. 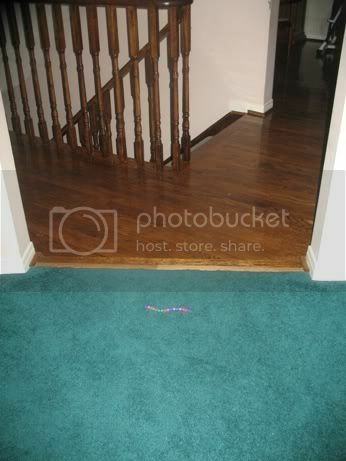 And replace the carpet with a more neutral color carpet – no clashing with the tile or hardwood. And get a flat-screen that will fit on the fireplace over the mantle. so back to the wood: definately would be too hard to match that hallway .. so yet, a good contrasting wood .. light maple, maybe a wider plank .. then it looks like you purposefully wanted a different look. you have alot to work with .. it depends how much time/money you want to put into it .. I hope you will post aft. pics when you decide what to do .. it would be a nice makeover! I agree with Chris, if you put down hard wood and paint neutral the couches will look good. I kind of agree with everyone. I would find a nice contrasting hardwood. I am not big on carpet either with my brood. 😉 For the walls….well… I am SOOOO not a blue person. I am more into warm, earth tone colours. A sage green could be nice. Or a very pale, but warm yellow, taupe defintitely – but a darker shade, almost a coffe-ish colour. You can go to the Benjamin Moore site and see rooms with different colours/shades of paint on the walls. I always use that when picking paint colours. Good luck!! And yes, definitely have to post ‘after’ pics!! I think you could pull off non-matching hardwood. Lay it on the diagonal, or the other direction to make it seem intentional! I may be crazy but what about continuing the tile you have in the kitchen? Then strip that horrid white paint from the fire place or cover with a wood that matches the cabinets. For color, with the cool color on the floor you can go darker on the walls. I would go with a complimenting tone to your main furniture pieces – maybe select an accent piece that you love and work with the colors in it – like your throw pillows. you must be so excited! deciding what to do, though, is tough. 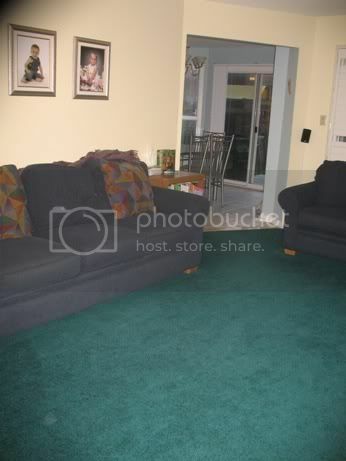 we had this ugly green carpet in the basement (was green in style?) and thanks to the flood a few summers ago, we were able to get new carpet. the problem was, i couldn’t pick one. anything was better than the green! I’m going to go ahead and plug my bro’s wife Sabrina’s new website to give you some good ideas: http://homeinteriorguide.com. I can talk to my dad about flooring and fireplace ideas — he’s TOTALLY the DUDE to go to. k, I’m not reading the other comments just because. IMHO, I’d say light blue-gray for the walls. Hardwood for the floors, but either totally lighter or darker than the other – you WANT it to look different if you can’t find an exact match. Get an area rug or carpet remnant (you can add your own border) if you want something “soft” to add ‘the touch’. I don’t know what your tastes are as far as the rest of the house, but I’d either drywall over the brick or do the slate on the fireplace…and I don’t think your idea of a TV is too big. phew. I just came here on a link from Bella. I have no advice. I get my furniture from the side of the road and paint in whatever mis-tints Canadian Tire is selling for 5 bucks a gallon. OMG what an awesome idea… pimping your place out for ideas. Gawd, I wish I could come over and force mine all over you… that room has so much potential. And tell your husband NO room is too small for a 50 inch flat screen HD plasma… I kick mine in the balls every day for talking me into a 42 inch….damn 42 inch. Ok, so I took a picture of the wall where we mounted our TV and put this awesome wicked sleek flat entertainment center under it…I’ll email it to you. ya, ok… so how do I email it to you? If you pop over to my blog you can send me an email and I’ll send the pic back to you if you want to see it. … no pressure though. … but don’t you want the picture? Propecia. Do propecia side effects go away. Fertility and propecia. Buy propecia….